This is what happens when you overstuff it with cheese. I say there is never enough cheese so I decided to show you the one that blew up instead of the pretty perfect photo. That cheese didn't make the plate, it got eaten first! Hopefully you will be a better judge in filling your calzone! Roll dough out on a piece of parchment paper, ( about a half pound of dough) around 1/4 inch thick. Sprinkle with garlic powder, cayenne, oregano, parsley, salt, pepper to taste. Top with shredded mozzarella, mushrooms and roasted peppers evenly on the seasonings. Fold over using the parchment paper to stick seam to seam like a turnover half moon shape. Brush with beaten egg whites or whole egg. 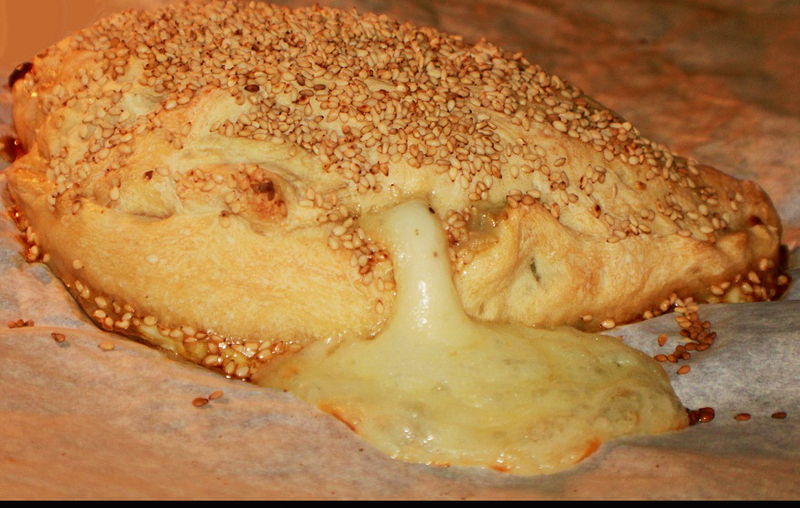 Sprinkle with sesame seeds and bake in a preheated 425 degree oven until browned around 25 to 35 minutes. Serve with Marinara Sauce for dipping. Prosciutto, capicola, mortadela, bacon, chicken, pork, sausage, ham all diced in small pieces. Feta cheese, mozzarella, Mexican blends, swiss. You can also use other sauces, hot sauce, barbecue, ranch and fill with your favorites. Mix and match with any combination you like. well it looks yummy to me =) If ever I make one I will not over the cheese. it looks yummy to me, actually I love cheese. Delicious!Very very tasty ciabatta. I could have this for lunch today... mmm.. Brava! PegasusLegend, this is abolutely amazing. I'm literally drooling over that melted cheese coming out of the Calzone. This sounds like a tasty calzone. I have never seen one with sesame seeds, which would add more flavor. You can personalize the flavors in a pizza, but you can't very well eat a slice on the go without making a mess. The next option would be these lovely Calzones. That first teaser picture with the cheese oozing out does make you wonder what other delicious things are packed inside-yum! Thanks for posting this one Claudia! I would definitely overstuff my calzone with cheese and eat it before anyone noticed. All that cheese with mushrooms is the grandest meal. the melty cheese looks great! I haven't made calzones in a long time, thanks for the inspiration! Oh, this looks AMAZING! I would have overstuffed it, too, but I'm always happy to clean up that extra gooey cheese. So wonderful and delicious! there is no such thing as too much cheese; love this! Ooooooh, I'll take an overstuffed one :) Yummmm! Never tried to make calzone with cabiata dough, but it sure looks amazing!Yum! I love calzones but always find them way too filling! Love the "blown up" one. LOL Have a nice day. Not been commenting as much - was busy there for a period. I love that you've overstuffed it with cheese--that's not a mistake, that's a bonus!